OXFORD, Miss. – In late June of 2016, PY4 student Caroline Bobinger traveled to Peru with ten people, including four other PY4 students from the School of Pharmacy and a preceptor from Jackson. 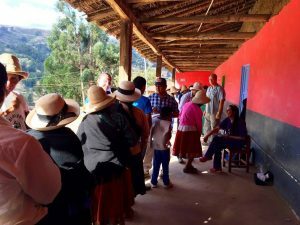 The mission of the trip was to deliver and administer medicine and medical supplies to people of Peruvian and Quechuan descent living in the Peruvian Andes mountains. First Baptist Church of Jackson sponsored the trip, so the group also shared messages of faith with the people they met. 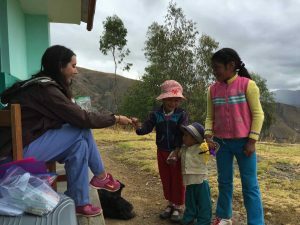 The School of Pharmacy spoke with Bobinger about her experiences while in Peru. School of Pharmacy: What made you decide to go on this trip? Caroline Bobinger: I had a deep desire to go on an international medical mission trip and to use the knowledge I have gained in pharmacy school to help those in need. I am a devout Christian and saw this mission trip as an opportunity to share my faith with unreached villages. 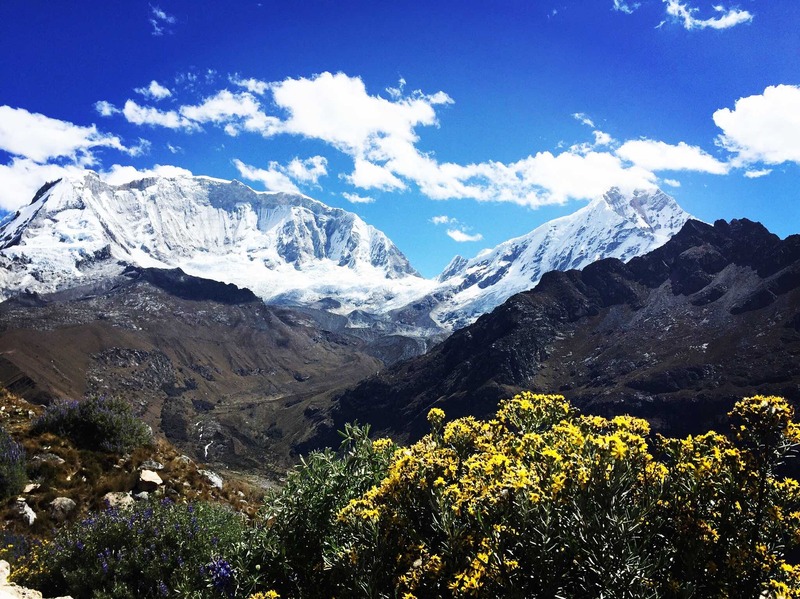 The group traveled through Huascaran National Park near Huaraz, Peru. SOP: Where were you traveling, and how long were you there? CB: The mission trip began as the team boarded a plane in Jackson, Mississippi and traveled for the next 12 hours to Lima, Peru. The second day we navigated through traffic in Lima and traveled ten hours in trucks to Huaraz. The third day was the most challenging travel day of the trip as we drove another ten hours over the narrow rocky roads up the mountain to Pomabamba. During this leg of the trip, we drove 150 miles over bumpy switchback roads with steep, sharp turns only wide enough for one vehicle. We were stationed in Pomabamba for five days with four days of clinic and one day of rest. During these five days, we traveled an hour or so each day outside of Pomabamba to different villages to host medical clinics. Then at night would we travel back to our base in Pomabamba where we had nightly devotions and meetings to discuss the events of the day. After five days in the Andes Mountains, we headed to Huaraz and then finally back to Lima. The entire trip lasted approximately 12 days. SOP: Can you describe a typical day on the trip? 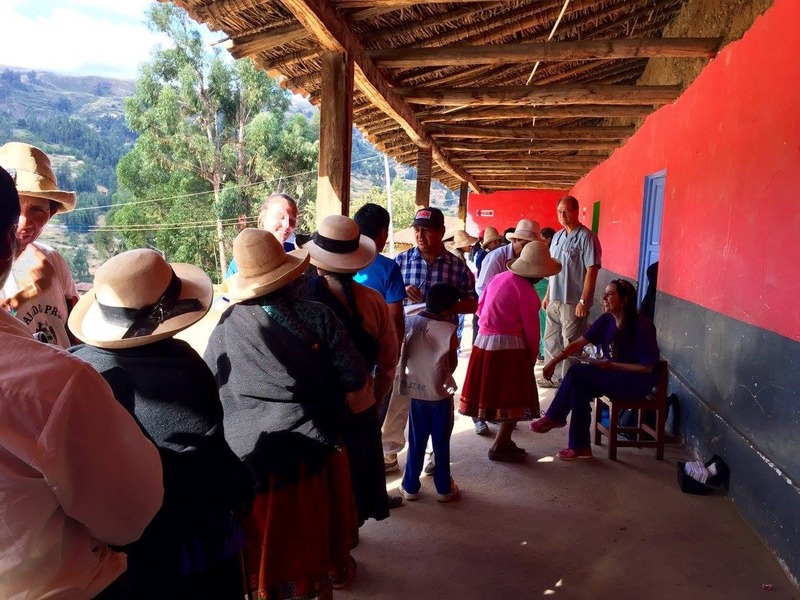 PY4 student Caroline Bobinger attends to Peruvian villagers waiting to receive medical care. CB: On a typical clinic day, we would get up at 7:00 a.m. and eat breakfast around 8:00 or 8:30 a.m. Then we would travel in our trucks to different remote villages outside of Pomabamba where we would host medical clinics. Once we arrived at the village we would unload the medical supplies stored in 12 large containers and set up the different workstations. The first station was for evangelism where the people of Peru would hear the gospel in their language. Then they would see a physician and have their medical conditions diagnosed and have medications prescribed. Next, the people would pick up their medications at the pharmacy and be counseled on how to take their meds. At the medical clinic they also had the opportunity to get eyeglasses and receive Chapstick and worm medication. The pharmacy students would rotate stations throughout the four days of clinic so they had the opportunity to work at each station. SOP: What was an extraordinary experience you had while you were there? CB: One day, one of the Peruvian women came up to me and had a basket full of roasted nuts that she had just prepared. She had a big smile on her face and offered me some of the nuts. This meant so much to me because she did not have many material possessions, but she still wanted to give me something in return for what we had done to help her people. Another day, we arrived and expected to set up clinic in a local school. When our trucks arrived, we found the school locked and we had no tables or chairs. We had a quick change in plan and set up the clinic, pharmacy and the eyeglasses station under the porch of the school. We built a church with three trucks, two tarps and zip ties, and attached the tarps to the side of the school. That particular day, we saw 152 people in the clinic, filled 477 prescriptions and fitted 123 villagers with reading glasses. It was amazing to see the people come from all directions to receive assistance at our makeshift clinic. SOP: Can you speak about the people you met? CB: The Peruvian people gave me so much more than I gave them. Everyone was so grateful that we made the journey to his or her village. They all had big smiles on their faces and were so grateful for everything we did for them. I will never forget their joy they expressed to us. One particular day, the village children picked wildflowers for the ladies on the trip and gave us gorgeous bouquets of flowers to express their love and appreciation. Bobinger gives lollipops to Peruvian children. Photos courtesy of Caroline Bobinger. SOP: How will your work help the people you met in Peru? CB: We gave every person we saw at the clinic some type of medication. Many adults had back pain due to carrying heavy items daily, and we gave them pain medication to relieve the pain. Also, many had indigestion problems, so we gave them Tums. Because they live so high in the mountains, many had sunburns on their faces. We gave them face cream to soothe the burns. While the medications will not last them forever, it was our hope that these acts of love and kindness would be something they would always remember. Also, because we also shared the gospel with them, we hoped this would change lives of the villagers for many generations to come. SOP: How did the trip affect your point of view? CB: This trip made me so feel so blessed that I grew up in a nation with basic everyday conveniences such as clean water and food. I am more aware of and grateful for the small things that we as Americans take for granted each and every day. I was amazed at the generosity of the Peruvian people and how grateful they were that we were there to serve them. I will always remember these people and what they taught me. I would encourage upcoming PY3s and PY4s to consider going on this trip. It is a life changer! To find out more about global pharmacy opportunities in summer 2017, contact Dr. Kris Harrell, Director of Experiential Affairs for the University of Mississippi School of Pharmacy, at kharrell@umc.edu. An interest meeting will be held in December of 2016.